Director – Brett Donowho, Screenplay – Cam Cannon, Rachel Long & Brian Pittman, Producer – Rick Dugdale, Photography – Edd Lukas, Music – Nathan Wann Walton, Visual Effects – Digital Effects Group, Production Design – Johnny Flanagan. Production Company – Outsider Pictures/Enderby Entertainment. Following the death of her father, teenager Jordan goes to stay with her late mother’s twin sister Anne Sanders and her husband Kevin in Silverton, Oregon. While on a date with Larry Parrish at Silver Falls, Jordan learns of the ghosts that supposedly haunt the area. They flee as the party is busted by police. In the midst of her flight through the woods, Jordan discovers a ring and puts it on. Back home, she finds that the ring will not come off. She then starts to see the ghost of a dead girl everywhere she goes. As the ghost starts to affect her more and more, the Sanders’ seek psychiatric treatment, thinking that Jordan is suffering delusions. Jordan however believes that it is the ghosts of two twins who are drawing her to find their murderer. A Haunting at Silver Falls is the third film from Brett Donowho. Donowho has had a modest career as an actor. As director, Donowho previously made No Tell Motel (2012) and The Sacred (2012) and subsequently went onto 5 Souls (2013) and Salvation (2016), all of which rest in the horror genre. I had no particular preconceptions about A Haunting at Silver Falls, nor had I seen any of Brett Donowho’s other films. 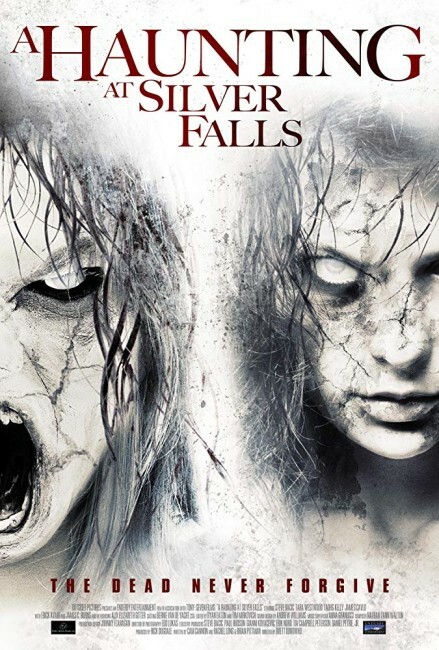 However, A Haunting at Silver Falls started to turn me off with its opening credit that claims it is based on a true story. The ‘based on a true story’ credit is something that has been used by a number of ghost stories/supernatural films in recent years – see the likes of An American Haunting (2005), The Amityville Horror (2005), The Exorcism of Emily Rose (2005), The Haunting in Connecticut (2009), The Rite (2011), The Possession (2012), The Conjuring (2013) and The Quiet Ones (2014). Most of these are based on scanty claims – outrightly fictionalised in the case of The Amityville Horror – that fall down under sceptical examination, while most of the so-called ‘facts’ have been considerably embellished to make for a more interesting film. Given that A Haunting at Silver Falls offers up no other details about its supposedly true claim, this is something that you can only sceptically regard as a promotional fictionalisation. Nor does the rest of the film do much to elevate one’s hopes. Brett Donowho directs it with all the blandness of a Lifetime tv movie – as the adoptive father, Steve Bacic even looks more like a ruggedly handsome tv soap opera star. There is precious little in any of the ghostly appearances that do anything to raise one’s pulse or let one think that Brett Donowho is offering up a single move that he has not copied from some other ghost story. There is a mildly interesting scene early on where the ghost seems to be trying to tug the ring off the sleeping Alex Elizabeth Gitter’s finger but thereafter the film slips into the predictable and utterly routine. The only real surprise the film ever manages to pull is the revelation of who the real killers are. Elsewhere, Donowho pulls out all the cliches – of people around Gitter dismissing her claims of ghosts due to her troubled past; the forgotten incident from the past needing to be resolved in the present-day – indeed, while the film starts out trying to scare us with the appearances of the malevolent ghost, by the end it has Gitter and the ghost working together to expose the killers. And when it comes to scenes where psychologist Erick Avari insists that Alex Elizabeth Gitter goes alone to see a convicted murderer who killed a bunch of other girls as part of forcibly removing her delusion of a belief in ghosts, any pretence that what we are seeing exists in the realm of being ‘based on a true story’ has entirely evaporated.